With the ever-increasing number and quality of entries received by the Trust year on year, judging the Sandford St Martin Awards has become more and more of an immersive experience. Not least for our shortlisters who are charged with having to negotiate long lists of sometimes very different programmes, made for very different audiences with hugely varying budgets. Agreeing a final few for the shortlist is never an easy task and, what shortlisters tell me is that, even after the final list has been agreed, they’re often “haunted” by a programme that personally resonated with or inspired them but isn’t in the final running for an Award. Such is the case with Bryony Taylor, a priest and the assistant curate at St Michael and All Angels Church in Houghton-le-Spring, who helped shortlist in this year’s Interview category. 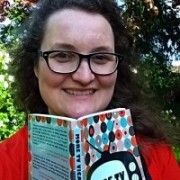 In a vlog, originally posted and which you can watch on her own website, Bryony drew inspiration from “A Thousand Words” with Iain Campbell, a programme made by GRF Christian Radio for the smallVOICE podcast. Iain Campbell is a portrait painter and Artist in Residence at St George’s Tron Church of Scotland in Glasgow city centre. In this interview he talks about his painting ‘Our Last Supper‘. Inspired, Bryony used the painting to inform her own meditation for Lent. This is a painting imagining a modern day Last Supper – Jesus with his disciples around a table. 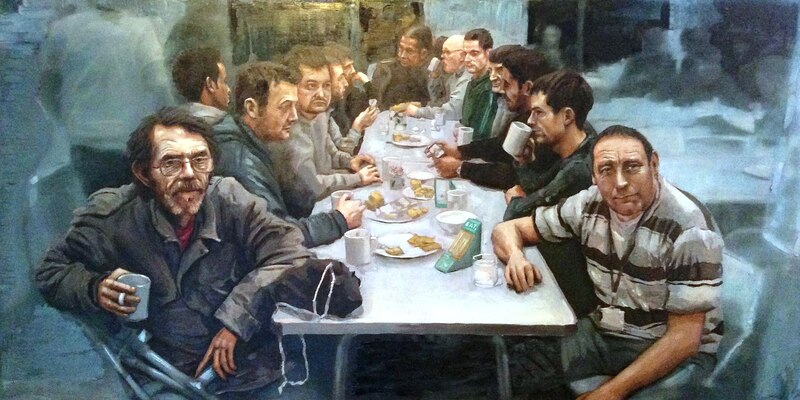 The figures in the painting are the men that attend a homeless charity in Glasgow. Our images of Jesus and the disciples are often sanitised. We have images of men in long flowing robes with beards and halos walking around. In reality, Jesus based his ministry in the forgotten North East of a forgotten part of the Roman Empire. The back of beyond, literally. He chose as the people to spend his time with, those on the edge of the community. The people excluded by others. The poor fishermen scratching a living on the shores of Lake Galilee. A young man that was part of a terrorist cell seeking to resist the Roman occupation. A hated employee of the government, a tax collector. Not to mention various women, some of whom had a history of mental health problems, others who were wealthy widows who put the lads up when they were visiting from town to town. Many people ask which one of the men is Jesus. But the artist deliberately left it unclear. Judas had to go over in the Garden of Gethsemane and embrace Jesus to let the guards know which one Jesus was; it wasn’t obvious which of them was Jesus. Do you see him in different places, in different people? The artist chose to paint the Last Supper because Jesus said ‘Do this in remembrance of me’ – share a meal together to remember me. Don’t remember me in the isolation of the cross, all alone. Remember me among friends, around a table, enjoying food together. This is how I want you to remember me. Our thanks to smallVOICE, Iain Campbell and Bryony for sharing their work with us. It’s worth knowing both that you can see the original of Iain’s painting at The Wild Olive Tree café in Glasgow and that Bryony is the author of the book ‘More TV Vicar?‘ a enthusiast’s romp through the annals of British television to discover what Christians on television say about our attitudes to religion and the religious.